When you think of Leo, think of royalty – then you’ll get the idea of what the Leo character is all about and why Leos are the way they are. It is true that, for various reasons, some Leo-born do not always express this quality – but even if not they should like to do so. A monarch rules not by example (as does Aries) nor by consensus (as do Capricorn and Aquarius) but by personal will. Will is law. Personal taste becomes the style that is imitated by all subjects. A monarch is somehow larger than life. This is how a Leo desires to be. When you dispute the personal will of a Leo it is serious business. He or she takes it as a personal affront, an insult. Leos will let you know that their will carries authority and that to disobey is demeaning and disrespectful. 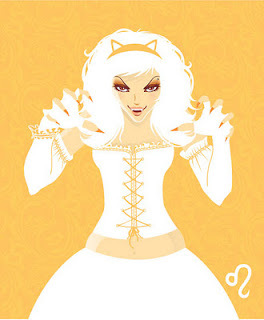 A Leo is king (or queen) of his or her personal domain. Subordinates, friends and family are the loyal and trusted subjects. Leos rule with benevolent grace and in the best interests of others. They have a powerful presence; indeed, they are powerful people. They seem to attract attention in any social gathering. They stand out because they are stars in their domain. Leos feel that, like the Sun, they are made to shine and rule. Leos feel that they were born to special privilege and royal prerogatives – and most of them attain this status, at least to some degree. The Sun is the ruler of this sign, and when you think of sunshine it is very difficult to feel unhealthy or depressed. Somehow the light of the Sun is the very antithesis of illness and apathy. Leos love life. They also love to have fun; they love drama, music, the theatre and amusements of all sorts. These are the things that give joy to life. If – even in their best interests – you try to deprive Leos of their pleasures, good food, drink and entertainment, you run the serious risk of depriving them of the will to live. To them life without joy is no life at all. Leos epitomize humanity’s will to power. But power in and of itself – regardless of what some people say – is neither good nor evil. Only when power is abused does it become evil. Without power even good things cannot come to pass. Leos realize this and are uniquely qualified to wield power. Of all the signs, they do it most naturally. Capricorn, the other power sign of the zodiac, is a better manager and administrator than Leo – much better. But Leo outshines Capricorn in personal grace and presence. Leo loves power, whereas Capricorn assumes power out of a sense of duty.